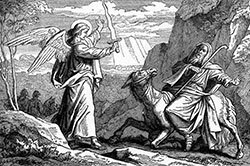 Balak the king of Moab wanted Balaam to come over and curse the children of Israel. He sent ambassadors to Balaam and Balaam said no I will not go.In Numbers 22:7 it tells us something that gives us a clue as to what's going to happen. “And the elders of Moab, and the elders of Midian departed with the rewards of divination in their hand.” What did they come with? They came with money. Now let's see what this prophet does. He refuses. In Numbers 22:12 it says, “God said unto Balaam thou shall not go with them. Thou shalt not curse the people, for they are blessed,” talking about Israel. And then he tells the ambassadors of Moab I’m not going so they go back and Balak sends more ambassadors to try to convince him. And this time they said they brought the message from Balak. I will promote thee unto very great honor and will do whatsoever thou saith unto me. First of all, it’s money, the rewards of divination or the rewards of prophecy.